It’s almost hard to believe that a year has passed and that today, August 9, 2015 marks the first anniversary of of Officer David Wilson having to put down Michael Brown in Ferguson, MO. Such sensationalized events must be remembered and memorialized, lest we forget what happened and doom ourselves to be shocked when history repeats itself. 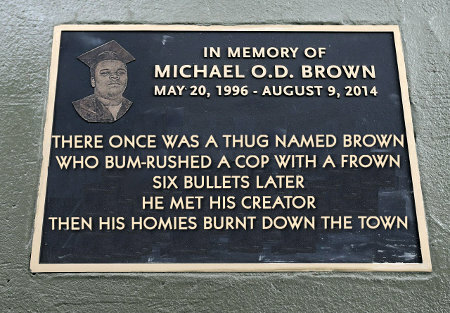 And there is, on the internet at least, a fitting memorial of Michael Brown. Apt, apropos, and a pithy, it a fitting summation of this ghetto thug’s existence and “contribution” to history. Yes, let each and every American remember Michael Brown’s death and the savage and senseless violence that sparked. let each and every American remember keep it in their minds that this is what happens when Americans have to deal with the more feral cultures we allow live within our border. This entry was posted on Sunday, August 9th, 2015 at 8:38 am and is filed under Humor, Society. You can leave a response, or trackback from your own site.